It's a tough job being on a honeymoon in South Australia. First, there's the wineries - in this case, the gorgeous, eucalypt-dotted Clare Valley. As I was the designated driver, Phil had to do the dirty job of testing wines from such illustrious vineyards as Tim Adams and Grosset, so was pleasantly inebriated by the time we decided to have lunch. Despite the fact we've got about 5 cases of wine leftover from the wedding, I still managed to convince Phil we needed to buy more. After all, can't come to SA and not buy wine! Then, there's the food. We picked up some incredible fresh ciabatta from a Barra Bakery, fresh fetta from the Neagles Glen winery, jam from somehwere on the road, fresh ripe tomatoes, a jar of olives, and settled down to the job of eating ourselves silly. 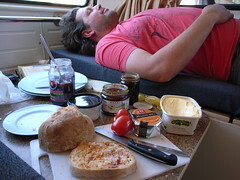 Phil was literally groaning with pleasure after each mouthful and in the warm spring sun, it was very hard to stay awake after a feast like that. It just keeps getting better too. We're spending a couple of nights in Adelaide, and thanks to a recommendation from Bex Jenkins, had the most incredible meal at Chianti Classico on Hutt St last night, followed by obscenely naughty breakfast at Citrus, also on Hutt St.
Tonight, we're planning organic pizzas with local, seasonal produce. I always seem to blog about food ... hmm.